Another Ryder Cup and another loss, that makes three in a row. The USA needs to have a fresh approach on how to play the Ryder Cup. What’s concerning that the talk of today is that, Phil Mickelson answered a question honestly instead of giving some politically correct answer and is now being taken to task for it. Personally I like the open and honest answer, it’s refreshing. Too bad more golfers or athletes don’t answer the same way, regardless of the fall out. Mickelson is not the problem here, the guys who didn’t win a point and barely got 1 or so because of a couple halves are. You can make the argument the USA didn’t have it’s best team. Because Dustin Johnson, Jason Dufner and Tiger Woods weren’t there. But there is no reason to believe that the outcome would be any different. Woods losing record speaks for itself, and Johnson and Dufner haven’t steamrollered the Euro’s either. So what happens now, does the PGA quickly bring back Paul Azinger the hero of Valhalla in 2008. We will hear about the Pod system now for a while. While some in Minnesota might want local hero Tom Lehman to get a shot as the next captain, I’m not sure that’s in the cards. Will Steve Stricker get his shot in 2020 at Kohler, maybe not if there is another loss or two by then. Perhaps Mickelson should be the captain, it’s puts the bullseye right on him. Maybe that’s what the USA needs, maybe Woods can be the vice-captain. There is a team for you. It’s been said for years that the Euro’s have more at this event, and that their liquor cabinet is always much more empty than the Americans. Perhaps Team USA should drink up a little more, bottom’s up. Then again a little more action between the guys in 2016 when games and bets are made during PGA tour weeks, maybe some foursome games might work. Hazeltine 2016 should be an interesting time, but things will be much interesting before then like later this year when the new captain gets picked. THE FALL TRIP..I have started the fall trip. It will go from Chicago to Long Island and back, over two weeks. The first stop is the French Lick Resort in Southern Indiana and home of the 11th USGA State team Championship. All of the players have finally arrived in spite of the air traffic woes from the mess in Aurora. Today was a stop at Sultans Run GC a course that has been being managed of late by the resort, but that seems about to change. The course is in Jasper about 25 miles from French Lick, and worth the drive. The final green has waterfalls behind it, and Donald Trump didn’t even put them in. I’ll be checking in from time to time. Stay tuned. The Jack Nicklaus boyhood golf course is up next, it has a senior open on tap for 2016. It’s nice to be on the road again, so far the weather is great hope it stays that way. Keeping my fingers crossed as I follow my own advice, I am out playing, you should as well. Golf Nation has announced they are shutting their doors on September 30th. 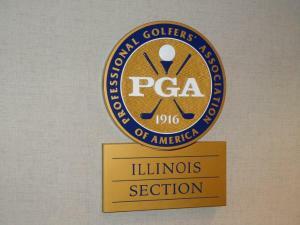 The long-time Palatine indoor and outdoor golf practice facility has regrettably announced, that they are permanently closing their doors on September 30th. Golf Nation had health club facilities and a bar and grill area. Just last December Arlington Hts. resident and the top rated junior golfer Doug Ghim announced his intentions to attend the University of Texas on a golf scholarship at Golf Nation. Ghim signed his letter of intent at Golf Nation with the camera’s of both members and local media flashing. But that wasn’t enough to help bring in some needed new members and business. While many people who belonged there, or went there didn’t find an issue. There were those who thought the location was hard to find. Golf Nation opened in 2008 and was quickly the place to be. The first year the club had 500 members, and won a national award for being a top new practice facility. But the statement for GM Tim Wuhrman said, ” a challenging economy and cutbacks by consumers on discretionary spending resulted in Golf Nation never growing to a sustainable level. Founder Bob DiMeo echoed the comments made by Wuhrman. Both thanked a loyal and friendly staff for their years of service. There will be an inventory sale of the merchandise in the club,ranging from golf equipment, food and kitchen items, TV’s and more. Call Wuhrman at the club if interested in purchasing any of the items. THE GOLF COURSES OF LAWSONIA..36 holes in Green Lake Wisconsin. Less than 3 hours from downtown Chicago. Stay and plays now available. Play the famed William Langford Links Course. Lawsonia now under the management of Oliphant Golf. Enjoy the new Langford Pub. See Lawsonia.com or call (920)-294-3320. The long wait is over, Sentry World in Stevens Point has opened. The golf course and the new PJ’s restaurant are open for business, as of this past Monday. Architect Jay Balasi’s work in the golf course is outstanding. Wisconsin’s first destination golf course, is back being a destination a golf course. Visit sentryworld.com for more information. FOXFORD HILLS in Cary is having fall specials and running customer appreciation days through Sept. 30th. Visit Foxfordhillsgolfclub.com or call (847)-639-0400. CHAPEL HILL in McHenry is now running a $26 weekday special through September 30th, check out the food specials as well. (815)-344-1894. SETTLERS HILL has fall specials. Call (630)-232-1636. Visit Settlershill.com. TANNA FARMS in Geneva, fall golf specials and come enjoy the food and beverage at Boonie’s. (630)-232-4300. BONNIE BROOK in Waukegan has great dining and special fall menu’s for you to enjoy after golf. Ribs and more, (847)-360-4730 or online at waukegangolf.com. RAVISLOE CC in Homewood has open tee times this week. Fall specials and more, call (708)-798-5600. THIS FRIDAY MORNING before 10 AM it’s just $59 dollars to play White Deer Run Golf Course in Vernon Hills. Whitedeergolf.com or call (847)-680-6100. DEERFIELD GOLF CLUB is doing some renovation work to it’s closing holes. As a result the temp greens will be in place. Special golf rates are in place while the work goes on. Deerfieldgolf.com. Shepherds Crook a Keith Foster design is running fall specials. Located on Green Bay Road in Zion, Shepherds Crook has 18 holes and one of the nicest 19th holes in the area. For more information see Shepherdscrook.org or call (847)-872-2080. Don’t forget to sign up for the Chili Open, coming soon. Come out this Friday or this weekend and enjoy some golf and then stay in the 19th hole to watch the Ryder Cup action live. The weather is great for fall golf, Go Play, and watch the Ryder Cup. “Whistling Straits-Clubhouse”, a new signature painting by artist Cassy Tully is now available and makes a perfect addition to any golf art collection or gift for your favorite golfer. Whistling Straits is part of the Kohler based American Club Resort and will host the 2015 PGA Championship. “Whistling Straits-Clubhouse” is an original painting Acrylic 24″x36″ panel, with elegant framing by Larson-Juhl Custom frames. The painting is now available at the Whistling Straits Golf Course pro shop and online visit Kohlerathome.com. Cassy Tully with the Wanamaker Trophy. “SUNRISE ON THE STRAITS” to artist Cassy Tully is a pristinely sculpted and captivating landscape. With her series, “Sunrise on the Straits,” Tully captures radiant hues, rich textures, graceful contours and a delicate play of light from the rugged and windswept terrain of the links-style golf course. Visit Cassytully.com to see the full “Sunrise on the Straits” collection and learn more. Tullys new art gallery is located in Plymouth Wisconsin, not far from Kohler. It’s here, Ryder Cup week. One of the most exciting weeks in golf. Some people compare it to Super Bowl week, others feel like it’s a super bowl style game with all the cheering and booing going on. Either way it should be a fun event to watch. It all wraps up on Sunday right before the Bears and Packers kickoff at Soldier Field. It will be a super Sunday. After the crushing loss at Medinah in 2012, Team USA wants this Ryder Cup badly. Can they pull it off, maybe or maybe not. Some of the experts expect it to be a team Europe blowout win. I don’t think so. Some of the Euro’s didn’t show much this past week on the golf course, the American’s had the week off. Captain Tom Watson, the last USA captain to win on foreign soil will be hard pressed to pull off the feat again. Watson is already being second guessed for his captains picks, and not adding to of the hotter players from the Fed Ex Cup playoffs, winner Billy Horschel and Chris Kirk who both played their best golf after the selections were made. Let’s hope they continue to play well and make the team at Hazeltine in 2016. Prediction here, no blow out win by the Euro’s. 14-14 tie wouldn’t surprise me, or 15-13 one way or the other. Who plays better in cooler weather. The temperature is supposed to be a high of 61 the 3 days of the matches, and the players and the fans might not see the sun all 3 days either. Welcome to Scotland. The USA is due to win again, maybe they finally will. CONGRATS TO Carlos Sainz Jr. of Elgin for earning his PGA Tour card from his efforts on the Web.com tour. The Web.com tour championship was in Florida this past weekend and Sainz just made barely made it to the next level. How many PGA Tour events will he get into, hard to say but that next level experience will be good for him. ILLINI ALUM D.A. Points was going to play in the Web.com final, but then did a WD aftersome players complained about him being there. Points who struggled on the PGA Tour this year, but is exempt for 2015 because of his win at Houston in 2013, decided to break up an 8 week layoff by playing. He wanted to break in a new caddie too. Points has been getting the tip of the cap from public opinion, by pulling out and letting the regular web-tour guys trying to move up play for the money that was available. ILLINOIS made it two wins in a row, when they blew out the field at the Wolf Run invite this past weekend by 30 shots. Senior Brian Campbell lead the way, with Jr. Charlie Danielson right behind. Thomas Detry was back from the World Team Amateur event and Illinois looks to be a top competitor for the NCAA title come next spring. Northwestern is playing at Evanston Country Club today in it’s own invitational the Windon Championship. if your free head out to see some top college golf right here in town. Our weather is getting better as we head into the weekend and early next week, so say the the weather forecasters around town. Get out and tee it up at some great prices at several golf courses. 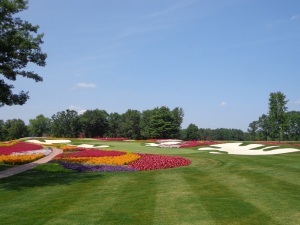 The Sentry World golf Course in Stevens Point Wisconsin, home of the famed flower hole, reopens later this week. See you on the links. Go Play RS. The 2014 Illinois PGA Senior Masters winners. John Schickling of Rolling Green CC (L) and Kevin Marion of the Old Elm Club. Photo Courtesy of IPGA and Mike Schoaf. 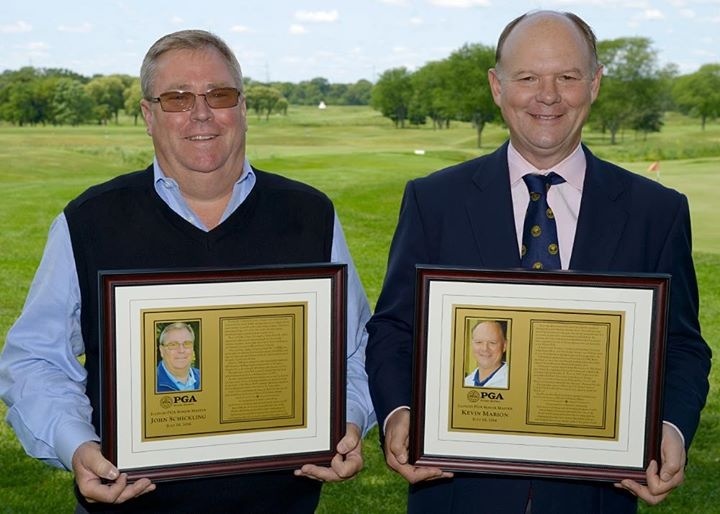 The Illinois PGA has announced that John Schickling from Rolling Green Country Club in Arlington Hts., and Kevin Marion of the Old Elm Club in Highland Park are the 2014 Senior Masters award recipients. 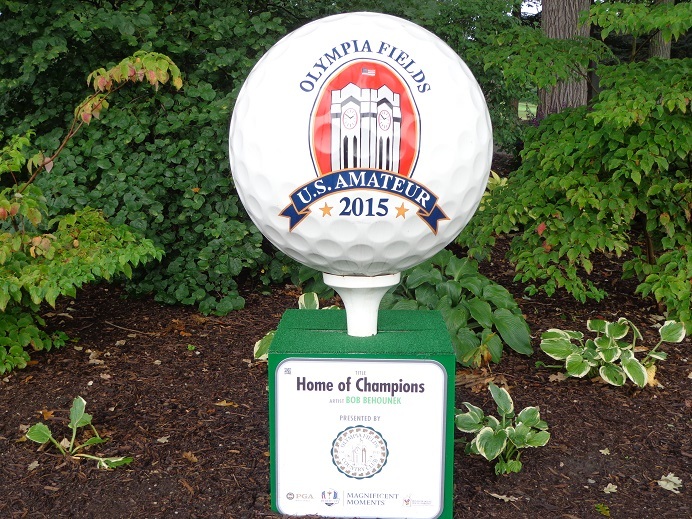 The senior masters pro-am was played in late July at the Onwentsia Club in Lake Forest. The golf club professional ranks are an industry where people move around, some pro’s spend their entire career bouncing from club to club. For Schickling that hasn’t been the case, as he has spent his entire career in golf working at just one club, Rolling Green Country Club. Schickling started at the club as an assistant professional and long time RGCC head professional Bill Ventresca. When Ventresca moved on, Schickling got elevated to head professional. 34 years after starting at Rolling Green, Schickling is still there. Schickling started playing golf as a kid with his dad at the Willow Run golf course in south suburban Mokena. When his father learned that some kids in the neighborhood were making money caddying at Ravisloe Country Club, he encouraged Schickling, who was only 12 years old to go try it. The family lived 15 miles from Ravisloe, so Schickling had to ride his bike, carpool or hitchhike to the club. Schickling went on to be the No.1 player on high school team, and then played college golf at Illinois State University. He was teammates was WGN-TV sports anchor Dan Roan and 1976 USGA Publinks champion and IPGA professional Jerry Vidovic. He just missed by a couple of years of playing with D.A. Wiebring. During his time with the IPGA, Schickling has served on several committee’s. His dedication and time spent being involved, has earned him his place as a IPGA senior master. KEVIN MARION grew up outside of Detroit, golf was not a part of his life in the early going. ” I just didn’t have a lot of exposure to golf,” Marion said. His sister was attending Ferris State University and told him about the PGM program the school had. Marion obtained a 2-year degree from Michigan State in turf management and then went to Ferris State. Four years later he was off and running in the golf world. 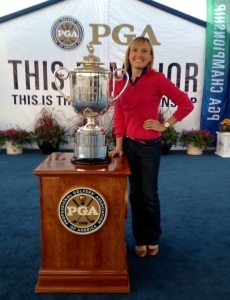 Four years later Marion returned to Michigan, and head professional and general manager at the Manistee Golf and CC. With Marion’s wife being from Hinsdale, the opportunity to become the head professional at Ruth Lake CC in 1992 was something he could not pass up. At that time he joined the Illinois PGA. During the winter months Marion would spend time at Pine Tree Golf Club in Florida, where pro Mike Adams would help him with his game. Pine Tree member and Rich Harvest Farms owner Jerry Rich, remembers getting a call one day from the head of the search committee asking about Marion for their GM/ head professional opening. Rich says he told them they wouldn’t regret hiring Marion. Old Elm did just that in 1997 and 17 years later Marion is still there. Marion has had his moments to be just as successful on the golf course, as he is off of it. In 2010 he won the Illinois Senior Open. That was one year after he made the cut in the 2009 U.S. Senior Open at Crooked Stick. He credits playing section events against fellow IPGA professionals like Jim Sobb, Gary Groh and Mike Harrigan, as being a privilege and making him a better player. 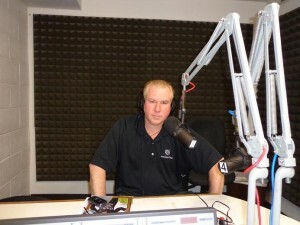 Click here to hear interviews with Kevin Marion and John Schickling. All of us at Golfers on Golf congratulate john Schickling and Kevin Marion on being named 2014 Sr. Masters award winners. The Western Golf Association (WGA) inducted PGA Tour caddie Steve Williams into the Caddie Hall of Fame, for his contributions in promoting caddies and their role in the game of golf. 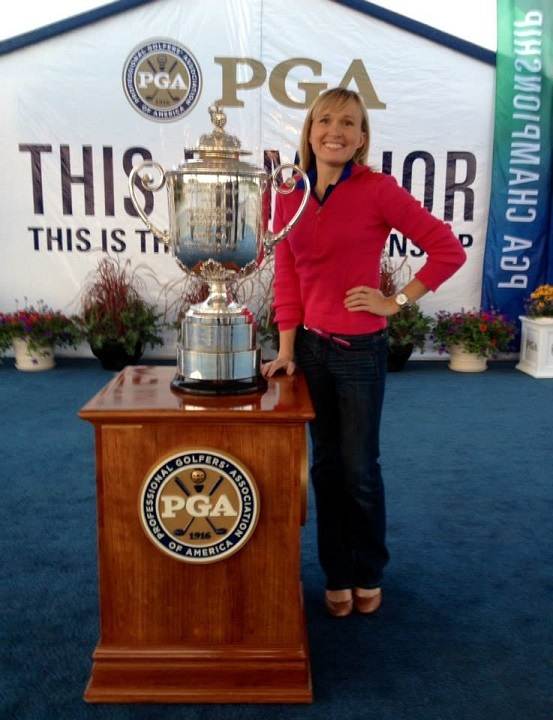 Williams received the bronze statue from NBC and Golf Channel anchor Steve Sands, at the BMW Championship in Cherry Hills Colorado. “For more than 15 years, no one has been more synonymous with caddying than Steve Williams,” said WGA President & CEo John Kaczkowski.” In addition to caddying for major champions Tiger Woods and Adam Scott, Steve has elevated the profiles of caddies worldwide and inspired countless young people to want to be caddies. Williams started as a caddie near his home in New Zealand at the age of 10. His first job in the professional ranks was for Australian great Peter Thomson when he was just 13 years old. before joining Woods he caddied for Greg Norman and Raymond Floyd. Woods won 13 major titles with Williams on the bag, Scott won the 2013 Masters with Williams on his bag. THE EVENS SCHOLARS CUP was held on Monday of the BMW Championship week at Cherry Hills Country Club. A total of 108 golfers took part in the outing. The Evans Scholars Cup raised more than $500,000 dollars for the Evan Scholars. Peter Evans a freshman at the University of Colorado, was named the recipient of the 2014 PGA Tour Chip Beck award. Evans is from Little Rock Arkansas, and is a Biology major. His is a caddie at the Alotian Club in Roland Arkansas. During the event the Colorado Golf Association made a donation of $51,700 to the Evans Scholars Foundation. Evans Scholars who worked the event that day, also donated over $5,000 dollars from fees and tips to the fund. The WGA is headquartered in Golf Illinois. Northwestern University has announced that Pat Goss has signed a new 5-year contract with the school to be the Director of Golf and Player Development, and David Inglis had been promoted from assistant coach to head coach. This is part of a restructuring of the Northwestern golf program, the announcement came from Vice President and Recreation Jim Phillips. Back in 2007 Goss was named Director of Golf, to oversee both the men’s and women’s golf programs. This while being the head coach of the men’s golf team. Now he adds Player Development to show his involvement with skill instruction. Goss is still a highly respected short game coach. Inglis who has been an assistant coach for five years, will add more of a day-to-day program administration responsibility to his role. This allows Goss to spend more time securing the future of Northwestern Golf. Goss has led Northwestern to 35 tournament titles, 15 NCAA Regional berths, nine Big Ten team and individual titles, and three NCAA top-10 finishes in his 18 year tenure as head coach. Goss is a four-time Big Ten Coach of the year, 1997 Golfweek National Coach of the Year, and a Golf Magazine Top-100 teacher in America. Phillips went on to commend Goss for the development of the Northwestern’s women’s golf program, and the hiring of current coach Emily Fletcher. Fletcher led Northwestern to it’s first Big Ten title in 2013. Phillips is glad to be keeping the Goss family in Evanston for years to come. Goss was pleased at the promotion of Inglis to head coach. That feeling was shared by Inglis. Tim Streng a former All-American at Western Illinois University, who goss coached throughout his college and professional career is working with Inglis and Goss this year as a volunteer coach at Northwestern. Streng is a teaching professional at the Wildcat Golf Academy. Northwestern starts it’s fall season this Sunday in the Windon Memorial Classic that will be played at Evanston Golf Club in Skokie. DAVID LIPSKY the 2010 Big Ten Champion and a 2011 graduate of Northwestern, won his first European Tour event the Omega European Masters. What a weekend for Illinois, the Fighting Illini started off their golf season in fine form by winning their own invitational at Olympia Fields. The Illini got stellar play from the entire team including the freshman in beating several of top teams in the nation. As it so often seems to be, it all came down to the back nine on Sunday. That is where the Illini went under par, and Freshman like Dylan Meyer stepped up and won the tournament in his first college event. Illini Freshman Nick Hardy of Northbrook was T-12, toss in veterans Charlie Danielson 67 and Brian Campbell 66 with two of low rounds of the tournament, and Illinois and coach Mike Small are winners. The early play of both Meyer and Hardy show that Small did well in the recruiting department. This team could be real good by the time the NCAA Championships roll around next May. ILLINOIS goes for six straight titles at the Wolf Run invite near Indy this weekend, Northwestern plays the Windon Championship at Evanston on Sunday and Monday. GET WELL WISHES to Greg Norman, who almost lost his left hand in a chain saw accident. The Shark got lucky and didn’t do any major damage, but will have that left fin wrapped up for a while. THE FED EX CUP…Billy Horschel and Chris Kirk sure burst on the scene during the playoff season, but are they going to be the two names we hear about for weeks on end if the USA loses the Ryder Cup. It already seems that Captain Tom Watson is being second guessed for not picking these guys. Maybe for the time being everyone should get off of Watson’s back and let him do the coaching. There will be more time to debate this issue next month after the matches are over. I for one do not believe the USA will get blown out in Scotland, they might not win but I’m not expecting the rout that some “experts” are picking. I remember 2008 when Paul Azinger’s team had no chance. It didn’t have Tiger Woods, we’ll maybe that’s all it needed. Woods won’t be here this year either. CONGRATS TO HORSCHEL on winning the Fed Ex Cup, but it sounded like many of the top players were running on fumes by the last two weeks. Henrik Stenson was recently quoted as saying, many of the top players might disappear until the Florida swing in March. Needing the first two months of 2015 to rest up for the never ending PGA Tour season. That Commissioner Tim Finchem seems to be expanding. I think the players should be off from the Sunday before Thanksgiving, up until Kapalua in early January. WEB.COM Tour Championship is up this weekend. Good luck to Elgin’s Carlos Sainz Jr., the defending champion at the Chicago Open (coming up this October at Cantigny Golf). Illini alum D.A. Points is playing as well. Go get those PGA Tour cards. I KNOW the weather has been a bit nippy over the last week or so, but I’m sure we have not seen the last of some warm weather yet. I’m getting notices from plenty of local courses that are offering fall specials, on and off the golf course. There are plenty of scrambles and other outings going on, if you’re looking for something like that to play in. LAST SUNDAY, I played in a scramble at Shepherd’s Crook in Zion, and the course was in great shape. The Keith Foster design is a great links course, and the club is running some great fall deals. Shepherdscrook.org. (847)-872-2080. BIG 3 PARTNER Len Ziehm has put up some travel stories on his site, Lenziehmongolf.com, his most recent trip was to Northern Michigan. MISTWOOD GC, the original clubhouse is gone. There is a hole in the ground where the old one once stood. What’s coming will be spectacular. There is live camera onsite where you can watch the work as it moves along. I wish some of the clubs that are doing course renovations, would do that as well. MIKE MUNRO our Golfers on Golf Radio partner reminds everyone that he plans to have the White Pines Golf Dome up and running right around Saturday November 1st. That’s only 45 days away, is it almost dome season already…wow. NU-Northwestern University is making some news in it’s golf department, I’ll have the full story up shortly. But Pat Goss is getting a new 5 year deal, but the Wildcats are getting a new head coach on the mens side. The final round of the Illini-Olympia Fields Invitational was the best weather day of the of the tournament, and it was the best day for Illinois who shot a 3-under par 277 the best score of the championship to win by 11 shots.Illinois Freshman Dylan Meyer shared the medalist honors in his first college event. Meyer shot a 1-over par 71 to finish the event at +3. Meyer was tied by Stanford’s Maverick McNeely. This was the second time Illinois has won the championship, illinois won the title in 2008 and the individual honors went to current Illinois assistant coach Zach Barlow. the key was the final nine holes, where the Illinois counting scorers were 7 under par. Over days one and two Illinois was +15. Illinois Senior Brian Campbell who struggled on day one with a 10-over par 80, rallied in round 3 to shoot a 4-under par 66 the low round of the tournament. In third place was Illinois junior Charlie Danielson just one shot behind the leaders, Danielson shot a 3-under par 67 in the final round. Freshman Nick Hardy tied for 12th place with a score of +8 for the tournament. The final round team score of 277 by Illinois was only two shots off the tournament record set by Oklahoma State in 2007. Doug Ghim from Arlington Heights and a member of the University of Texas team tied for 23rd place and finished the 54 hole event at 12 over par. Illinois will return to tournament play next week at the Wolf Run Intercollegiate in Indiana where they will look for their fifth straight title in that tournament. 1. Illinois 861 +21, 2. Florida State 872, 3. Baylor 876, 4. Stanford 882, 5. Oklahoma State 885, 6. Texas 892, 7. Colorado 893, 8. Virginia Tech 895, 9. Alabama 897, 10. Oklahoma 898, 11. Texas A&M 900, 12. Michigan 903, 13.Arkansas 905, 14. Connecticut 909, 15. Indiana 307.